Liked so much we are getting another one for our cousin. User friendly with many uses. Searched many months until I found this one, I love it. My husband loves this table. 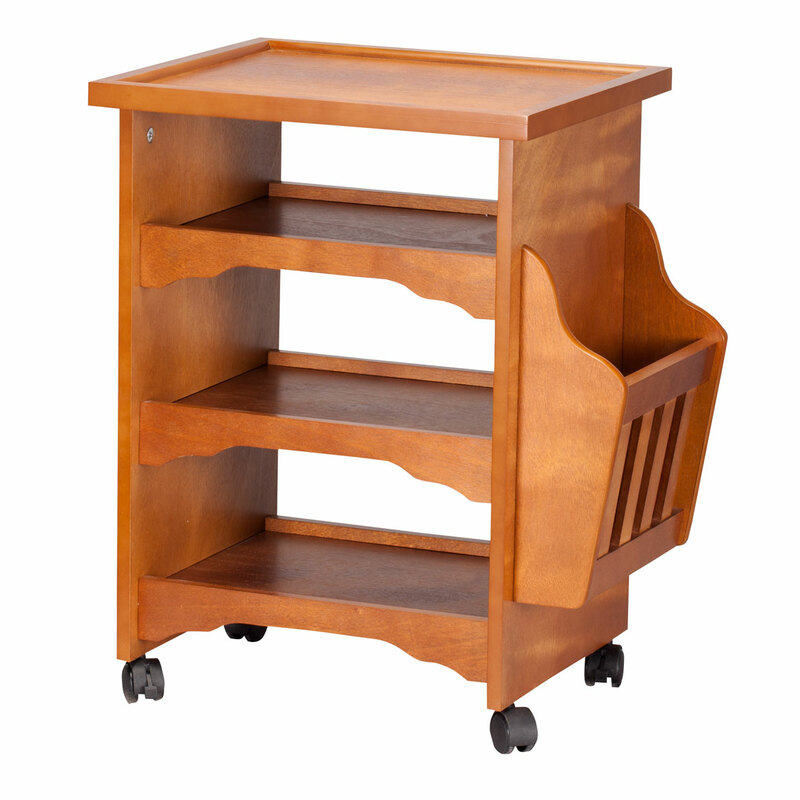 It's very sturdy and I love that it's adjustable and on wheels. Much better than a tv tray. I use this product at times to sit and have meals. I used it to take care of bills and also with a lap top. I love it! 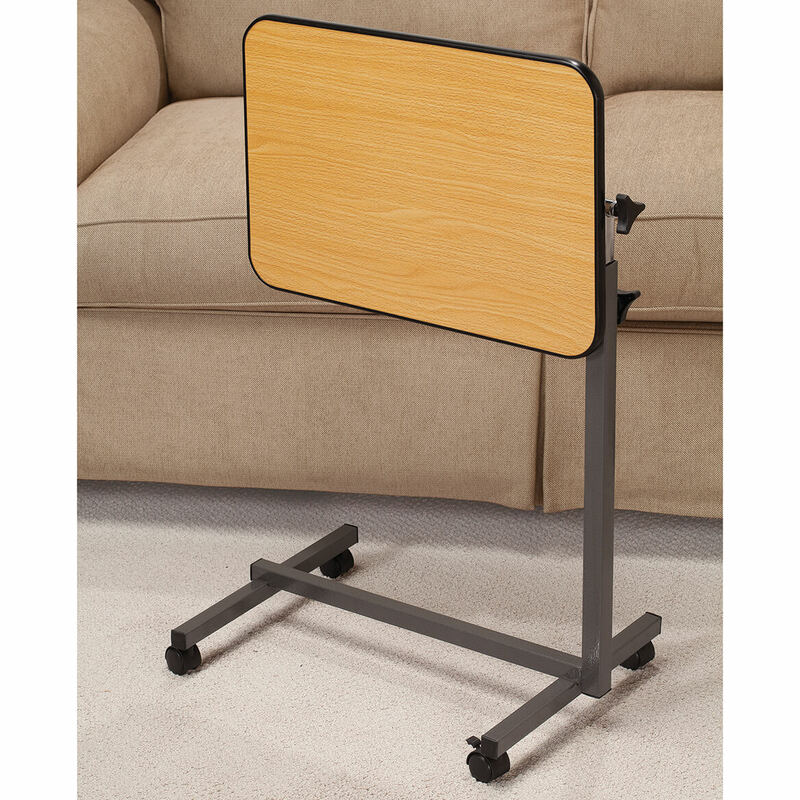 Great product,easy to assemble,got for my wife who is disabled and she loves it.works great for bed or any chair or couch,built very sterdy. Great product! Well made,nice design! 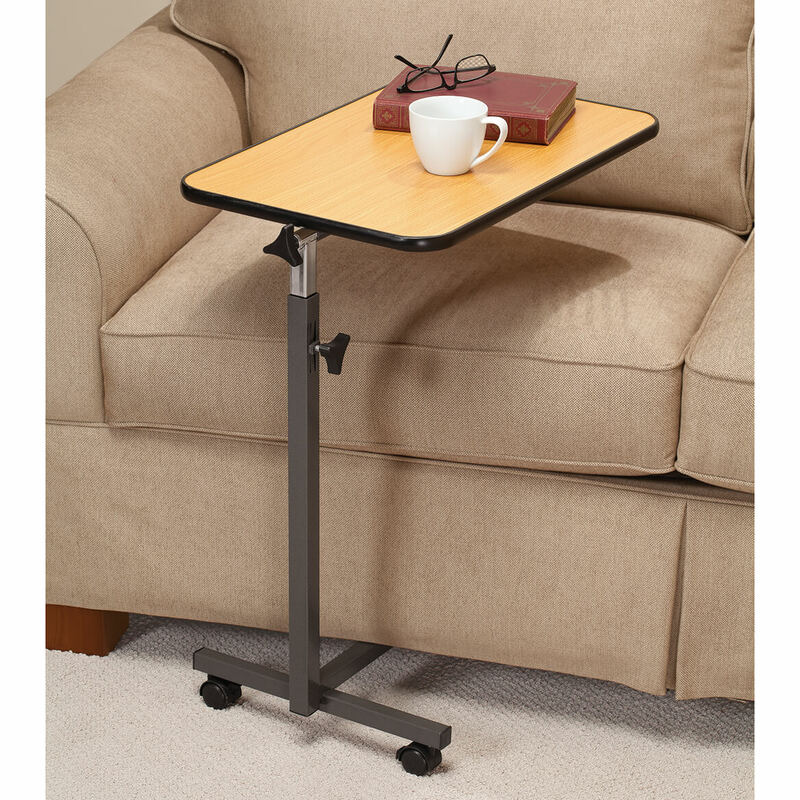 I bought this for myself for a table while recouperating after back surgery in bed. So I can eat in bed, put my computer, phone, drinks on it. It's wonderful to use it has great rollers on it, so it can also be put on the couch too! Works great. Every home should have one. We would definitely recommend this product. Works great ! Exactly what I needed and excepted! Perfect for what I need it for. If it goes on sale again with free shipping I may order another one. Helpful for my mom who suffered a stroke and has limitations. I'm disabled and it works better than a TV tray. It rolls. A TV tray doesn't. The casters are not heavy duty and the brakes don't lock very well. Other than that we would buy it again. Not what I thought it was. and not easy to put together, holes did not match up. The tubes that are supposed to fit together to allow this to adjust don't fit well, so the table can't be tightened in position well enough. The table top can shift angle at any second. It would be more functional if its height could be adjusted. I bought two of these things, had to send one back because of bad parts and the wheel broke off as well. They sent another one, so far so good, but the first one I kept the wheel keeps coming off. What do you expect for cheap labor? These things are not worth the money. The table was impossible to align properly. The piece that would hold the table flush, would not meet right and if you over tightened it, it would be off balance and if you under tightened it, it would be too loose. This all took place in about an hour or so. What a tremendous waste of time. Luckily, Miles Kimball has excellent customer service, which probably would not be needed so much if the products you sold were of much better quality. I need something I can place over the arm of my love seat similar to the picture of the item. 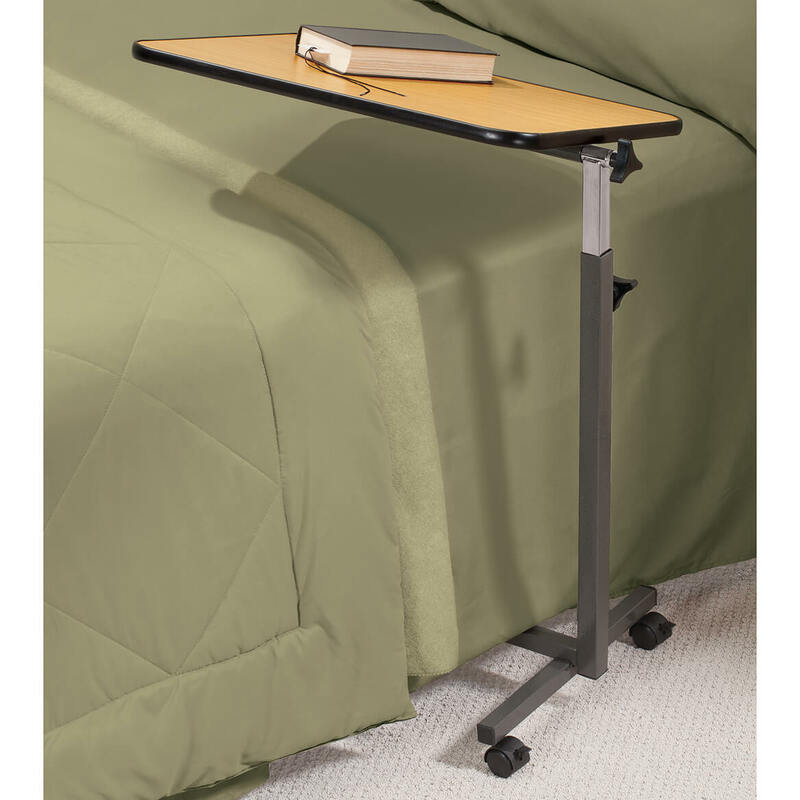 I have a friend who could use this table to eat in bed , when she's not feeling well , this would be so easy for her to relax in bed and eat or read in bed! I chose it to hold my computer handy. Purchasing for my 95 year old mother. Hopefully this will be sturdier than the tv tray she currently uses. Price, expect this table to last at least 1 year. Wanted comfort in reading my news paper, having tea, breakfast in bed, a table for family and friends to use. I like the side tilt of the table so I can store it. On wheels is a plus and the adjustment of the height is important. I think this will work out well. 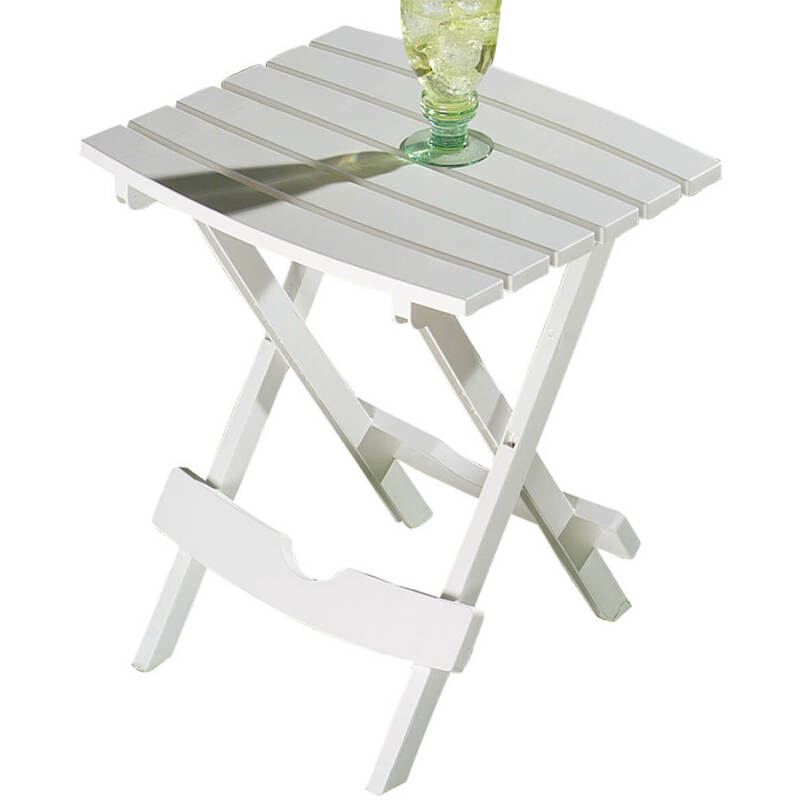 I have been looking at many tables and this one has it all. .
We eat in the living room, I ordered one for me, and hubby wanted one also. My father is almost 92, and loves to eat while he watches sports. I think that this will make getting his food to his favorite chair much easier! I like to read, play cards while watching TV and this table looks like it would be convenient for that purpose. I just hope it is sturdy. Computer is attached to the TV and we use a wireless key board and mouse. This is perfect!! 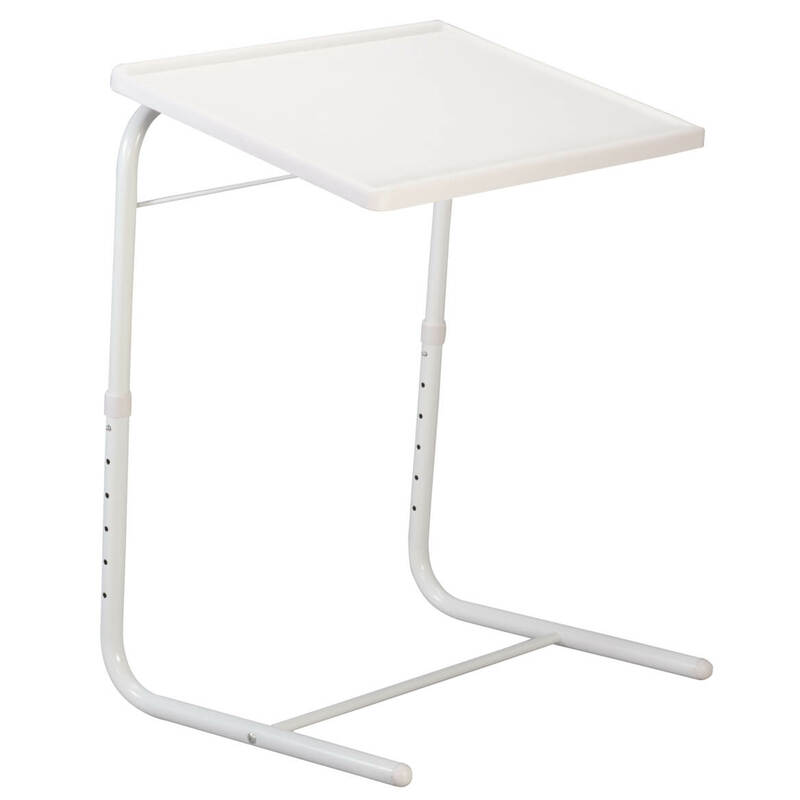 This table looked perfect in terms of size, adjustability and ease of use as a desk for beds, chairs or sofas. Good price too and looks like good quality. My aunt needed to have a tray that was on wheels and could be stored to the side. It looks like just what she needs. 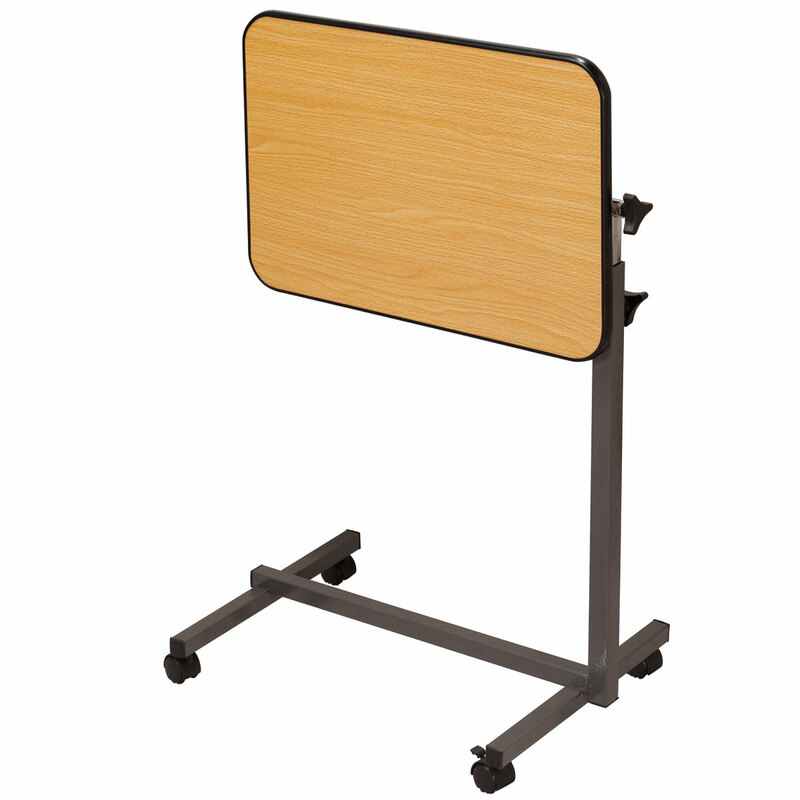 Needed a TV tray that could move easily and securely on a stone tiled floor. to help someone who can not get out of bed. They can use it to eat and read a book. do other things with. i am bedridden most of time . Because we couldn't order through the Miles Kimball website and gave up waiting for their customer service to answer our call. Your website is quick and easy to navigate! I need a good laptop/dinner tray. A little hard to put together but nice. Ease of using over a recliner, adjustable features makes it perfect to slide in from side!! Needed something to put my laptop on when I want to work from the living room. I make jewelry and this is exactly the kid and size table I was looking for. BEST ANSWER: Thank you for your question. The most weight the tray table can hold is 22 lbs. We hope this information will be of help to you. BEST ANSWER: Thank you for your question. The base of the Rolling Tray table is 3 ¾” tall. We hope this is of help to you. how high are the wheels? The wheels are about 2" high. Is the tray adjustable or just up or down? BEST ANSWER: Thank you for your question. 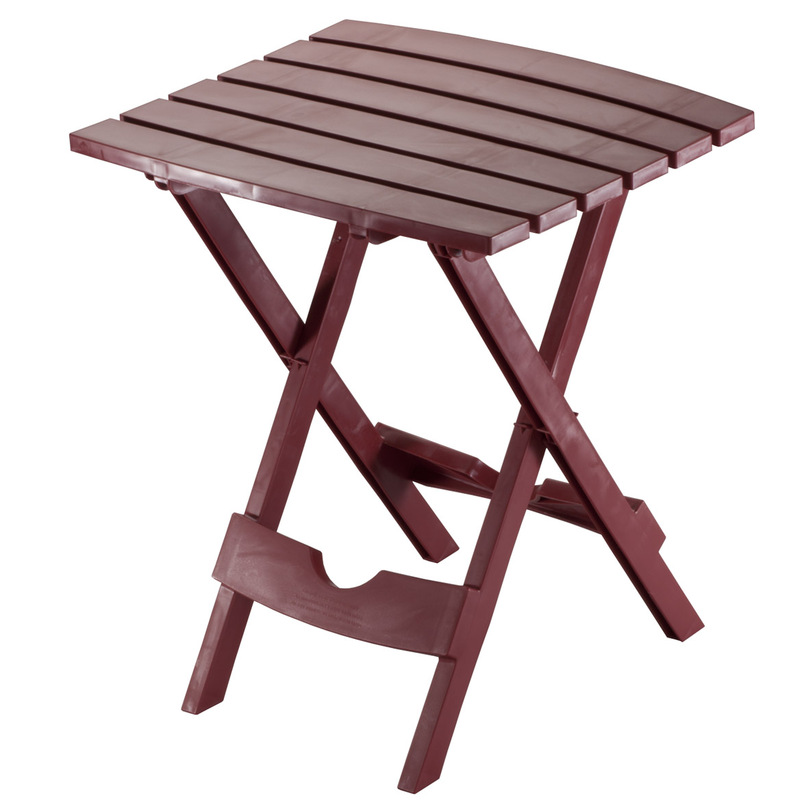 The Rolling Table Tray can be adjusted up and down and the tray can be tilted. We hope this information will be of help to you. BEST ANSWER: Thank you for your question. The height adjusts 27 1/2"-47". We hope this information will be of help to you. what is the detentions of the base? BEST ANSWER: Thank you for your question. The base measures 24” long x 16” wide. We hope this information will be of help to you. will it fit under a recliner? BEST ANSWER: Thank you for your question. From the floor to the top of the cross bar that would slide underneath furniture, it is 3 ¾” tall. We hope this information will be of help to you. BEST ANSWER: Thank you for your question. Unfortunately, no, the wheels cannot be replaced. We hope this information will be of help to you. BEST ANSWER: Thank you for your question. 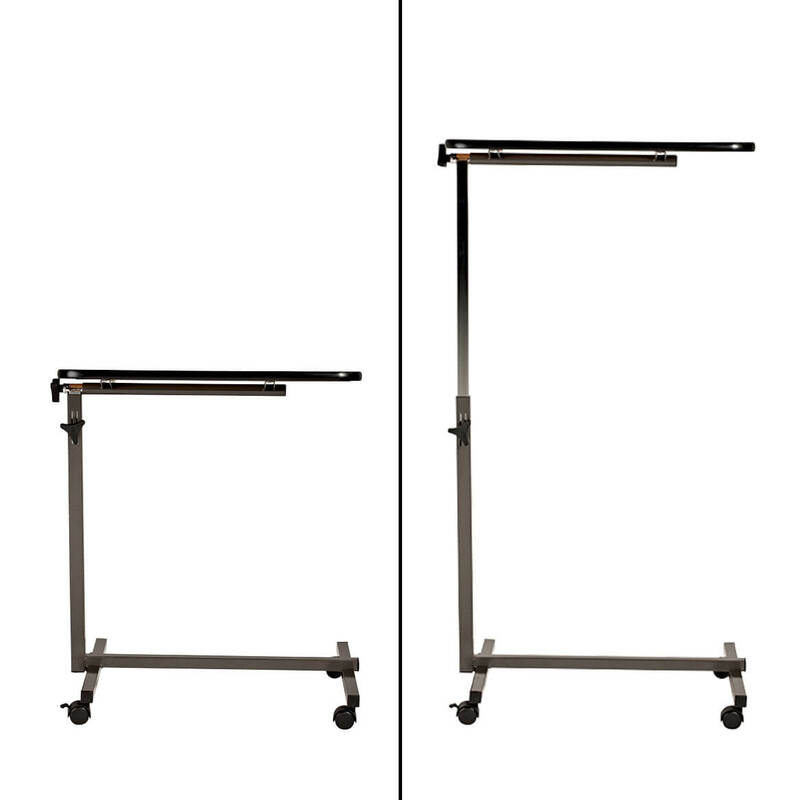 The height adjusts 27 1/2" - 47".We hope this information will be of help to you.